There is nothing wrong with telling someone that they are being irritating. A lot of times, people believe they are being witty or helpful when in fact they are merely annoying. Save someone else the pain of enduring their antics. But find a way to do it tactfully. The 10-80-10 Principle® is a framework that was designed to help individuals and groups create maximum performance. The methodology combines best-practices with small wins that allow users to capitalize on success while at the same time reducing and eliminating behaviors that limit successes. This book explains the principle and then gives numerous practical examples of where we can use and observe the principle – everything from elections to losing weight, from mortgages to sales. See the world through a 10-80-10 lens will help you significantly improve your individual and team results. What is Student Leadership all about? How do you become a Student Leader? What resources are available that will help students to proceed, exceed and succeed inleadership roles? The answer to all of these questions and many more can be found in the enjoyable and easy to read The ABCs of Student Leadership book. This book was specifically written to help students take charge of their own lives and start leading themselves. Whether you are looking to lead inside or outside of school this book is a powerful tool that is jam packed with examples, stories and exercises that will all the reader to empower them selves and start to succeed. What do Post-it Notes, bumblebees and Las Vegas casinos have in common? They each remind Sunjay Nath that nothing is impossible! What do you get when you start incorporating processes like the “Mom test” and the “underwear evaluation” into your daily activities? Sunjay thinks they’ll bring you one step closer to being a better student leader! But to be a good leader of others, you must first learn to lead yourself. 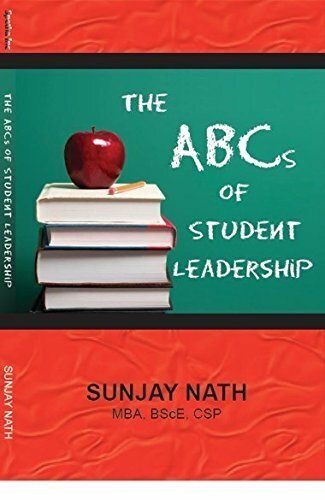 The ABCs of Student Leadership features nine chapters that will help you fine-tune your own attitudes and skills to do just that. Attitude, Action, Alliance, Balance, Belief, Behavior, Commitment,Change and Character: Sunjay’s collection of wisdom, stories, suggestions and guidelines about these key words will help you get motivated and…get involved. Each chapter includes a Leadership Journal and Exercises section that will help you identify new opportunities for you to grow, stretch your limits, and be the best you can be for yourself and for the people around you-whether you are a member of the chess team, a tuba player for the marching band, or the captain of the soccer team. So go ahead, start reading and leading! Are You Ready To Work With The Most Laid Back Speaker You Have Ever Worked With? His Keynote Presentations Are Extremely Funny, Highly Motivational And Consistently “Wow” Audiences With His Top Notch Content. Our consulting services are for organizations that are looking for a complete end-to-end solution focusing on improving performance and leadership within the organization. We are very selective of the organizations we work with in order to achieve maximum results. A consulting program is a combination of the other delivery methods with an overarching strategic focus. Consulting programs run between several months and several years. This is an experiential approach to improving Speaking Skills. The From the Platform workshop focuses on four main components of effective presentations; basics, rules, content and application with an experiential approach. Participants will be given exercises to practice and enhance their presentations skills throughout the sessions. This workshop builds part of the foundation to the 10-80-10 Principle®. If we acknowledge the way our personal bias forms our opinions and biases, we can easily be trapped by our own limiting beliefs. The goal of this session is to help move people from Impossible to Possible. This is done by bringing to surface some of the ways our own assumptions lead to our personal biases. Once we are aware of this, we can learn to question the rules and boundaries, which are often self-imposed. By questioning the barriers and re-approaching from a different perception we can make what was once impossible, possible. The 10-80-10 Principle® is a framework that allows you to increase your performance and results by focusing your energy and efforts on highest yielding activities. The Principle was created by Sunjay Nath and it help individuals and teams operate at a dynamic level. Every person or group already exhibits behaviors that are Top 10 (percent) – those behaviors that lead to high performance and achievement. What people lack is the knowledge to consistently operate at that dynamic Top 10 level. The 10-80-10 Principle® rewards and grows Top 10 behaviors and eliminates Bottom 10 actions. Engaging Hands on, Sunjay Nath works with the audience to identify their Top and Bottom 10 and then A.C.T. with the 10-80-10 Principle® to create greater performance levels in their lives, or within the organization. The 10-80-10 Principle® is sought after around the globe by businesses and organizations through Keynotes, Workshops, Coaching and on a Consulting basis.